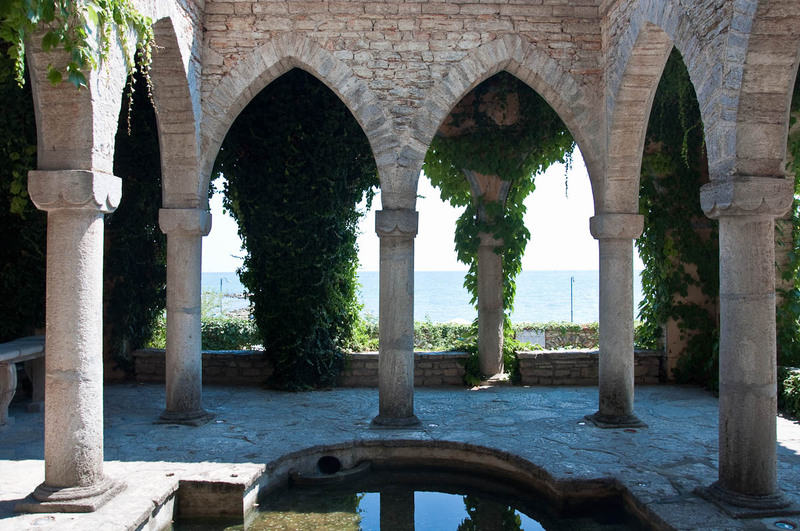 Let me preface it all by telling you that we went to Balchik on an extremely hot summer day. The sun was unrelenting, the air was dense with sweat and wetness and people, including us, walked around dazed and a bit confused. 2. The splendid Botanical Garden where huge cacti grow. And to wrap this short introduction up – everything described below is true. I understand that certain things may sound crazy and a bit absurd, but this is the effect my beloved motherland has started to have on me. Sometimes it makes me laugh out loud and sometimes it makes me cry, and often is both at the same time. 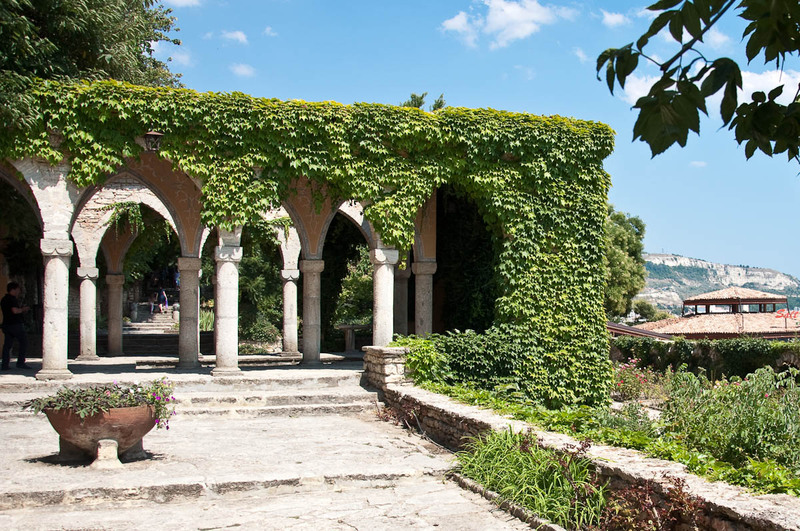 We were walking through the park of the Summer Palace in Balchik. Built between 1926 and 1937, it was a present from the Romanian King Ferdinand to his wife – Queen Maria. Born Princess Marie of Edinburgh she was a granddaughter of the formidable Queen Victoria and married Ferdinand after spurning the advances of her first cousin – the future British King George V (the grandfather of Queen Elizabeth II). 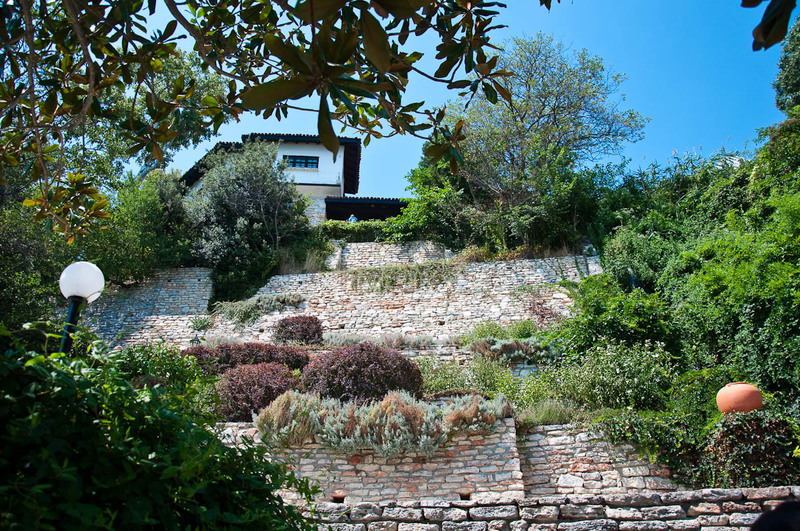 Marie visited Balchik – then a small fishermen’s village – in the early 20’s of the last century and fell in love with the place. 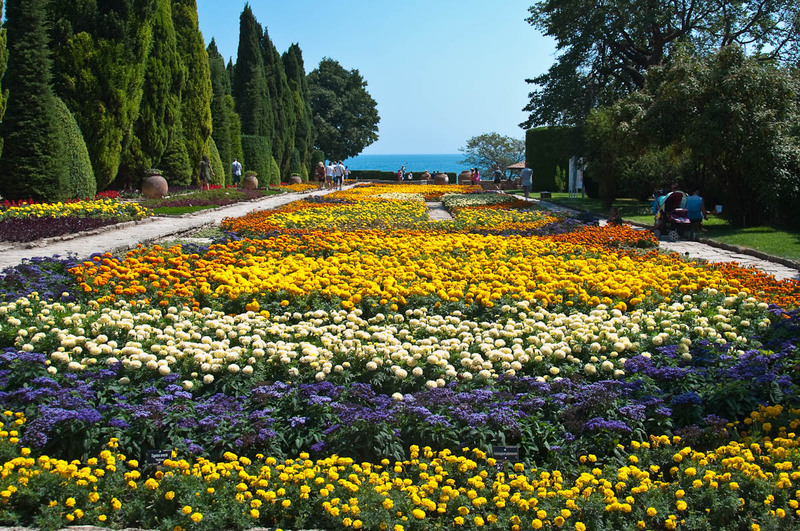 The turquoise waters of the Black Sea and the green hills sloping down to the sandy beaches captivated her heart and after the Summer Palace was built, she would return to it year after year. The palace, officially called ‘The Quiet Nest’, is actually more like a large villa combining traditional Bulgarian and Ottoman motifs. It is surrounded by a water mill, several other villas, a chapel and a wine cellar and it is situated within a beautiful park with small waterfalls, rose garden, tiny ponds and several such whimsical features and details. And as I told you, we were in the midst of this beautiful place (completely overwhelmed by tourists, but still managing to exude the peacefulness of its past), when our steps took us to the Temple of Water – a structure of stone arcs covered with lush ivy in the centre of which there is a small pond. Inside the temple, a man was playing a big xylophone. He would gauge where the passing tourists were from and immediately start playing a song from their country of origin in the hope that they would drop a coin or two in his hat. A pregnant cat was stretched on the stones behind him, also with a small bowl for donations by her paws. And just then I saw it: a big juicy sausage hanging on the wall of the temple. I couldn’t quite believe my eyes, so I immediately pointed the sausage to our small group. We all laughed, wondering what it was doing there. It was a thick flat sausage curved just like a horseshoe. It is typical for Bulgaria where it is called ‘sudjuk‘ (Bg. суджук). 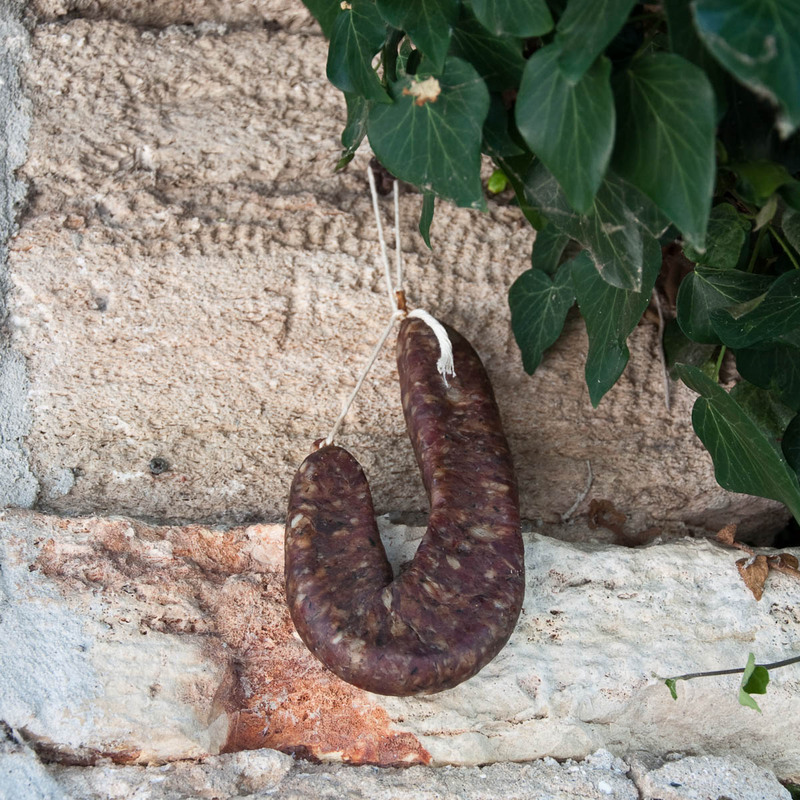 People would traditionally make sudjuks in winter by mincing pork meat, mixing it with a flavoursome mixture of herbs, stuffing it in sausage skins, flattening them and then hanging them up to dry over a certain amount of time. Once ready, the sudjuk would be sliced thinly and used as a meze with a thimbleful of rakia – the local alcoholic drink which usually reaches 40 degrees or more. Nowadays, obviously, you can walk into any food shop and buy yourself a sudjuk, but some people still prefer to make their own at home. So, this sudjuk was hanging there on the wall of the Temple of Water in the midst of the park of one of the few royal palaces still preserved in Bulgaria. I just couldn’t fathom why it was there. Was it a local superstition which warranted its presence?! Was it that Queen Marie was partial to a slice of sudjuk?! Was it that it was an offering to the nymphs which apparently inhabited the temple? ‘Ah, I brought it from home to dry it up there in the draft,’ he said. We all laughed. It was both incredibly funny and absurd. Just imagine taking a homemade sausage with you to work every day to dry up on a spot at your workplace just because there seems to be just the right type of draft passing through it. Or imagine walking through Edinburgh Castle and coming across a big haggis hanging there on the wall. Or perhaps a leg of jamon hanging in one of Spain’s Royal palaces. So we laughed with that spontaneous deep happy laughter which overwhelms you when you have been told an incredible joke, when something has caught you unawares and suddenly it has revealed to you something so ingenious which you, constrained by the chains of accepted social behaviour, would have never thought of yourself. And this was not all. The xylophone player gladly shared with us that he makes the sudjuks himself. He told us where he buys the meat from, how good it is and how once two years ago he forgot his sudjuk on the wall of the Temple of Water overnight and in the morning it was gone. The shock! 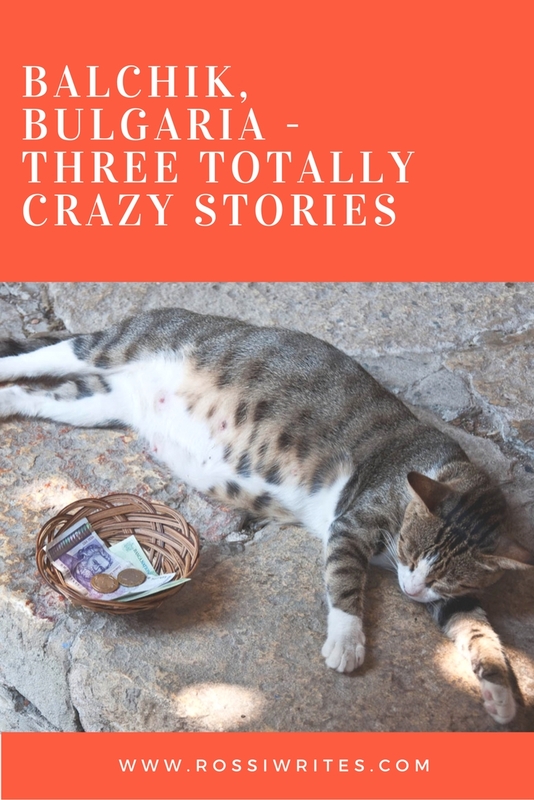 Then he shared with us, now captivated listeners to his story, that another time he was jumping up trying to get the sudjuk off the wall to take home at the end of a long day when he noticed two Japanese tourists watching him perplexed. He explained to them with gestures that this was a sausage which you slice and then eat as a meze with a glass of rakia, but apparently they understood that these sausages grow on the nearby trees so started looking up to try and see one for themselves. I hadn’t laughed so much for months. People, it was all so absurd and far-fetched, but as with most things in Bulgaria, the absolute truth! Plus it is still my favourite memory of that day. After exploring the Royal Palace and its park (sudjuk and all), we headed to the Botanical Garden just next door. 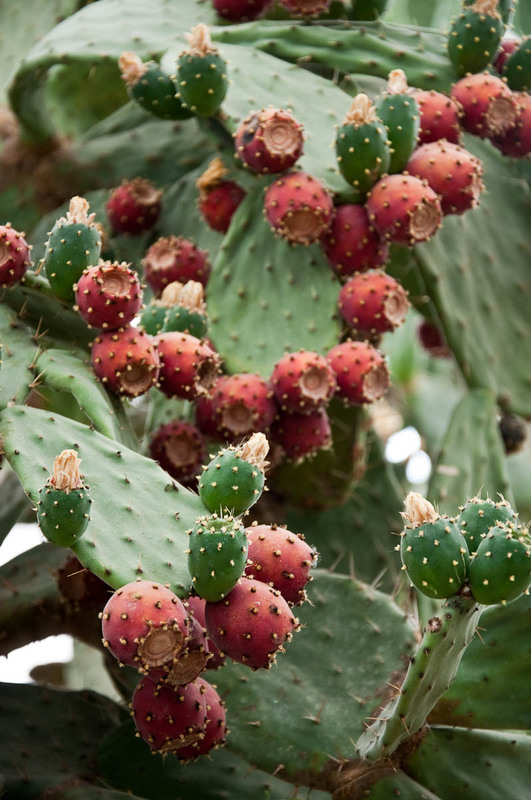 It is right next to the palace and it is famous with its huge cacti – cultivated both outside and inside a large greenhouse. 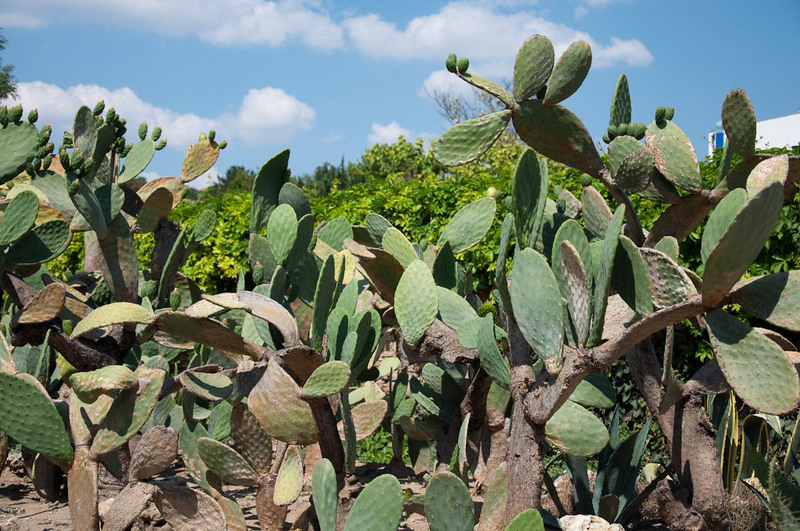 Apparently, the collection of cacti there is the second of its size in Europe, the largest being the one in Monaco. 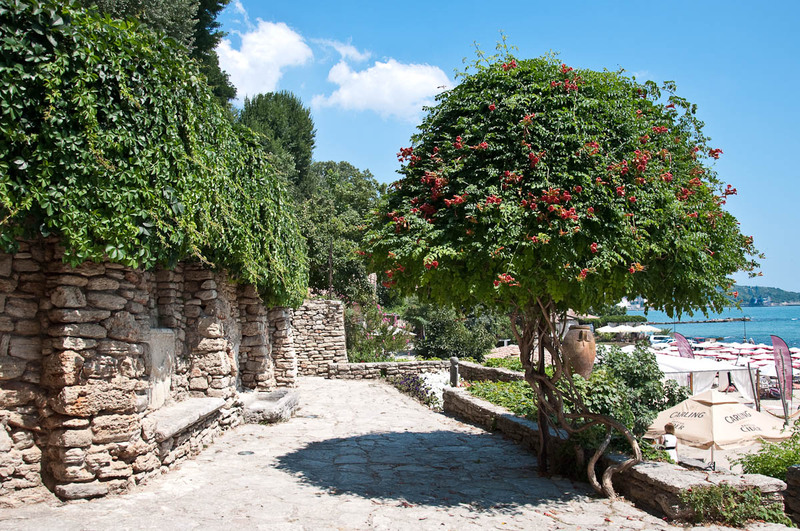 Balchik’s Botanical Garden is a lovely place with a great sea view. I remember visiting it as a child and marveling at the cacti and the colourful flower displays. I hadn’t been back for many years and was looking forward to rediscovering it for myself. 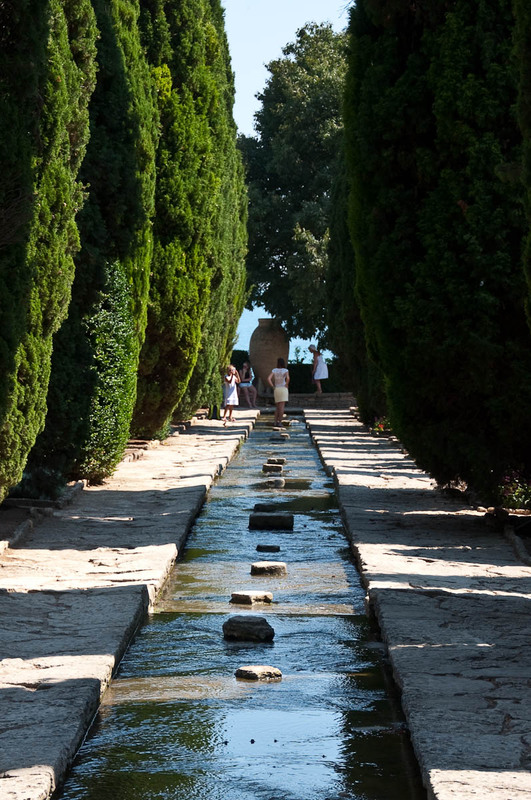 So, we were in the garden heading to the cacti display, when we came across a long shallow canal with stones forming something like a path in the middle of it. To reach the cacti we had to go up to the top of the canal and then turn right. As it happened, a couple had set up a tripod on the very narrow path along the canal and was busy taking selfies. We had to pass exactly where the tripod was placed but the young couple didn’t even acknowledge our presence there. Our small group consisted of three adults, a child and we had a buggy with us laden with bags. Well, the most natural thing would have been to ask the couple to move the tripod for a minute or two and then walk up. Somehow though we all felt a bit shy and unwilling to be perceived as rude. So as not to ‘hassle’ the couple and their tripod we spontaneously decided to cross over the canal by stepping on one of the big stones in the middle of it and then jump to the other side. My husband crossed over in a split second. It was my turn. I stepped on the stone in the middle, made to move my other leg across to the other side and somehow I lost balance. The last thing I remember is how my legs extended straight down the canal and then I was lying at full-length sideways on my hip in the shallow water. I was completely wet, a bit stressed and, suddenly, I felt so sorry for myself that I scrunched up my face and decided that it was a good idea to have a little cry. I looked up and saw my sister’s and my husband’s stunned faces followed by the teary face of my little daughter who was really worried that mummy had hurt herself. This made me snap back into action and try to get up. ‘I’m fine, I’m fine!’, I said. My sister helped me pull myself up from the slippery bottom of the canal. Unbelievably, I was not only not hurt, but my camera, which I was wearing across my body had not suffered at all during the fall. Yes, I was completely wet with water dripping from me, but it was sooo hot, this was actually good as it brought me a temporary cool and respite. Luckily, we had brought towels with us, as we were planning to go to the beach later on, so this and a nearby water fountain helped me clean up a bit and then dry myself. ‘Oh, so it was quite spiritual then!’, my husband chimed unable to resist cracking a joke about my spectacular fall. I gave him a dirty look. Now, if I tell you that the lunch was a disaster, this will not be exactly the truth. A disaster it was not, still it was another quite crazy experience on that wildly hot day. After seeing the Botanical Gardens, we decided to go back to the palace next door and have a quick lunch in the small restaurant adjacent to the royal wine cellar. 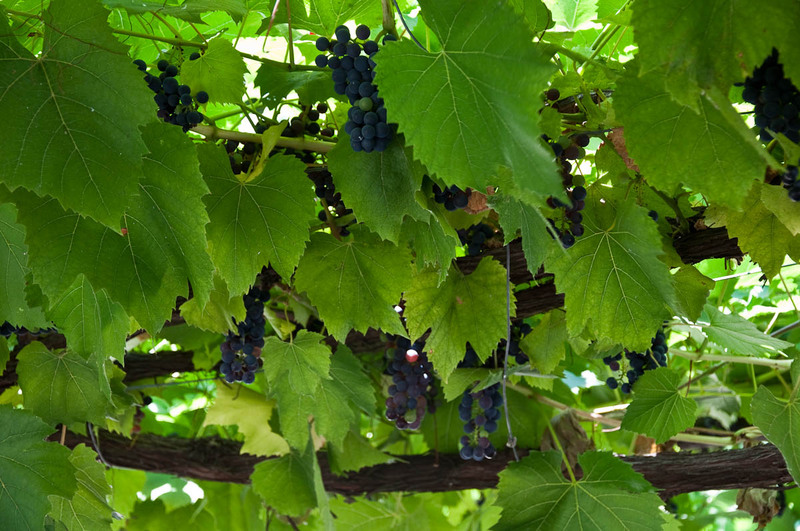 We found a table underneath the lush trellis vines and waited to be served. Which means that we waited for the waitress to finish her cigarette break which she was taking right in front of the restaurant by its five or six tables. Honestly, after having seen the staff of another restaurant we had gone to a few days before smoking inside the restaurant over their staff lunch while the customers were enjoying the sunny weather at the tables outside, I didn’t even give it a second thought to this particular waitress having her cigarette break in full view of everyone. When she was finished she brought us a menu – one for all of us – and I got another one from a nearby table to speed up the ordering process. Once we were ready, the waitress came again and wrote down our order. After that we chatted about the day and what-not. Now, when you are in a Bulgarian restaurant it is quite… I don’t want to say ‘typical’, but ‘typical’ is the right word here… for the food to be brought over not at the same time for the whole table, not in the logical sequence of the different courses, but simply when it is ready. So, you can be tucking in your second course, while your table-mate can be still waiting for their salad. Or you may have finished your main and still be waiting for the chips which were part of the garnish. All true stories. We looked at each other puzzled and then we got it. So, yes, it was a hot and crazy day. 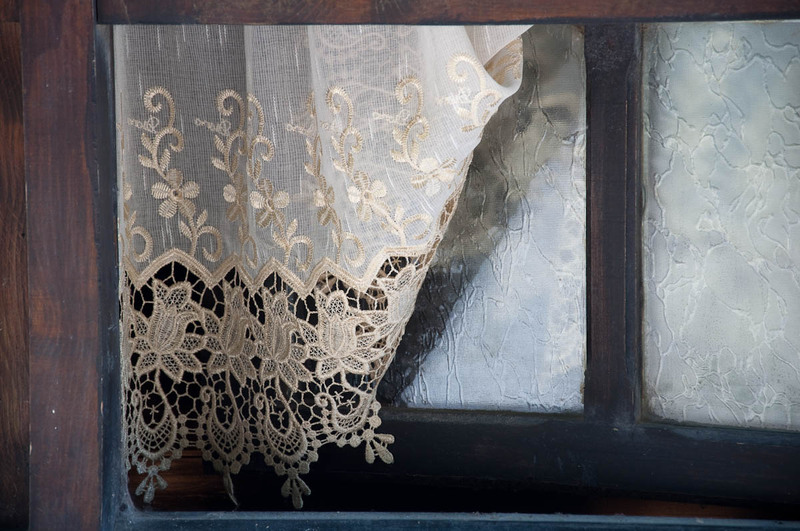 It is funny how such small offhand events often are much more memorable than yet another museum or palace stuffed with artifacts you have ticked off your must-see list. I still can’t think about that day we spent in Balchik without laughing to myself a little bit. What is the craziest thing that has happened to you during your travels? 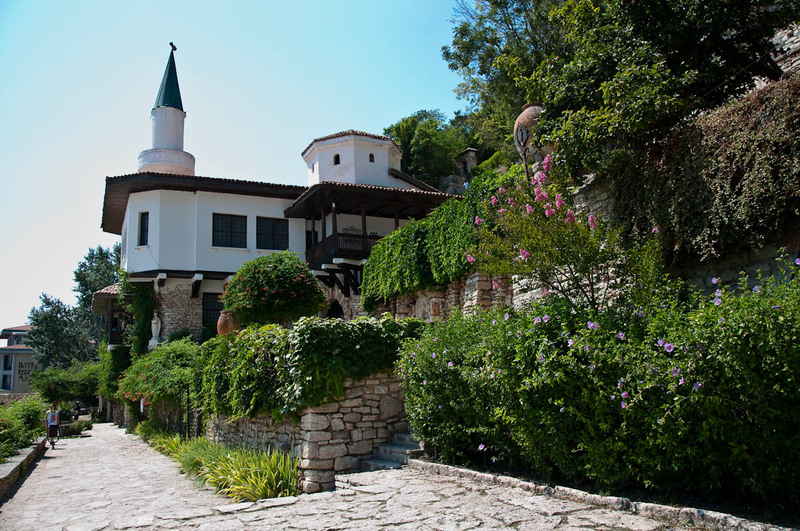 Have you been to Balchik before? What was your experience there? Let me know in the ‘Comments’ section below.